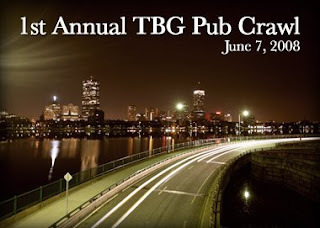 The 1st Annual TBG Pub Crawl, a one-day benefit for the Ted Everidge Memorial Fund, will take place in Boston on Saturday, June 7, 2008. The eight-bar event will get underway at noon at The Squealing Pig in Roxbury Crossing, located behind Back Bay Manor, where Ted lived for two years in college. The crawl then proceeds to three Northeastern-area bars - Punter's Pub, Conor Larkin's and Our House East - before heading to Boylston Street to hit Cactus Club and Whiskey's. A stop at Beantown Pub then breaks up the walk to the final destination of the crawl, Purple Shamrock. The 1st Annual TBG Pub Crawl will officially end at 7:15 p.m. on Union Street, but it's likely the festivities will continue throughout the night. All checks must be received by Thursday, May 29 to guarantee an event T-shirt. 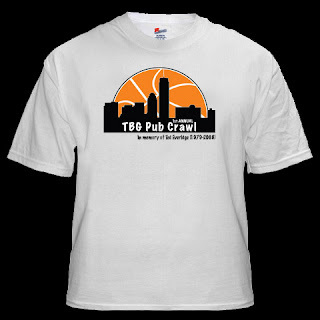 Attendees will receive the official "1st Annual TBG Pub Crawl" T-shirt (pictured right), so be sure to include your shirt size(s) with your ticket money. Appetizers will be provided at various locations on the crawl, but drinks are not included in the ticket price. All proceeds will benefit the Ted Everidge Memorial Fund. If you cannot attend but would still like to purchase a ticket to support the cause, then please include a note with your check and shirt size(s) and an event T-shirt will be mailed to you following the pub crawl.